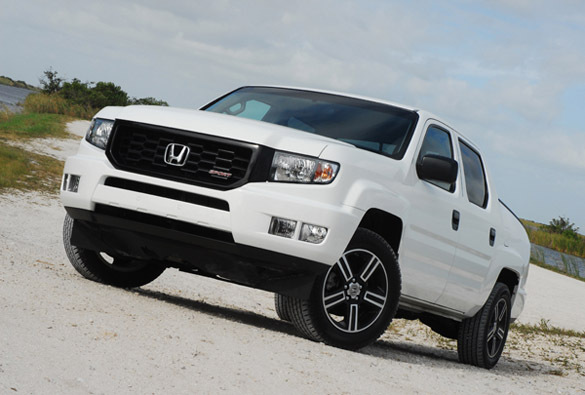 To help bolster sales in the important full-size pickup truck segment, Honda adds a sport appearance package to its unique and very functional Ridgeline pickup truck. While the fluid, one-piece appearance remains the Ridgeline’s most distinctive and sometimes controversial trait, the new Sport appearance package provides an even more unique look. The new Sport look is highlighted with black 18X7.5 in. aluminum alloy wheels wrapped with Michelin 245/60R18 in. all-season tires, a black honeycomb grille with a black surround and the Sport badge prominent on the left side, black headlamp housing, black taillight housings, black door handles and black side mirrors. Also there is a bump in EPA mileage rating of 15/21/17 city/highway/combined mpg, up 1 mpg in the highway rating. 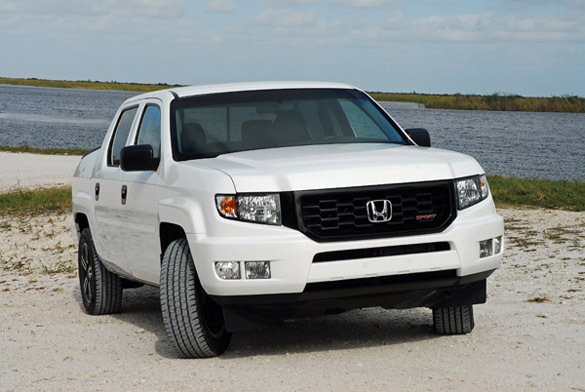 The Ridgeline represents an exclusive and innovative approach in the half-ton pickup truck segment by prioritizing its construction and features based on the capabilities that many recreational truck buyers typically need. Like most half-ton pickup trucks it can be used by tradesman and companies that need a pickup truck for doing their business, be it hauling a half-ton of cargo or towing up to 5,000 lbs. The Ridgeline is built with a closed-box, unitized body structure for a unique combination of capability, interior spaciousness and a comfortable performance ride from its independent front and rear suspension. It also delivers a wide range of conventional and business capabilities including a large, lockable In-Bed. The unit-body architecture is designed for vastly superior rigidity compared to traditional body-on-frame designs and provides the foundation for the Ridgeline’s spacious interior cabin and bed, safety performance and class-leading ride and handling performance. 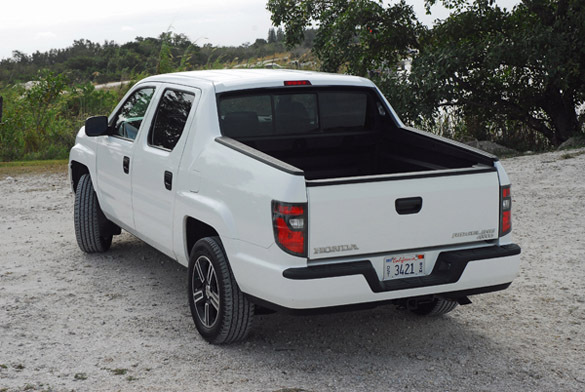 The Ridgeline’s modern and athletic design incorporates a solid, one-piece appearance with no separation between the bed and cab. Large side mirrors compliment rear vision while towing. The windshield wipers have a heated wiper zone to enhance wiper performance in cold, winter driving conditions and minimize ice scraping. 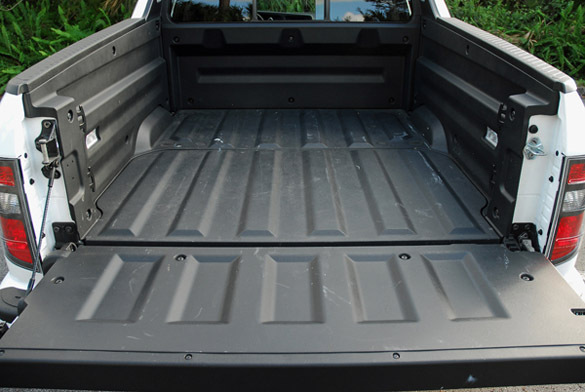 A 5 foot long composite cargo bed with eight tie-down locations provides a payload of 1,100 lbs. 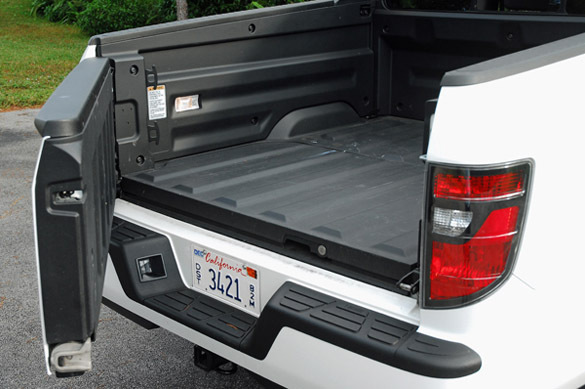 Four cargo area lights illuminate both the bed and the in-bed trunk. A dual-action tailgate opens down for traditional access to the cargo area or to the side for ease-of-access to the 8.5 cu.ft. in-Bed Trunk with lock. 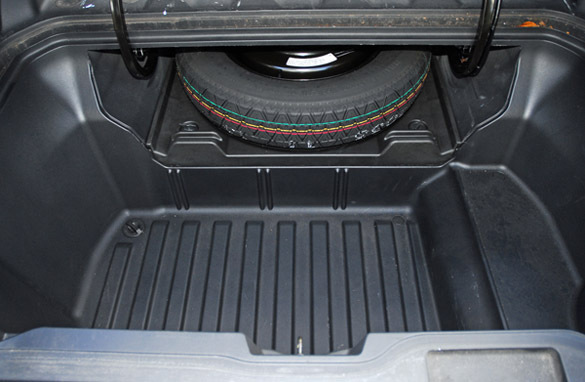 The trunk is also available with a wide variety of accessories and can conveniently accommodate motorcycles and ATVs. 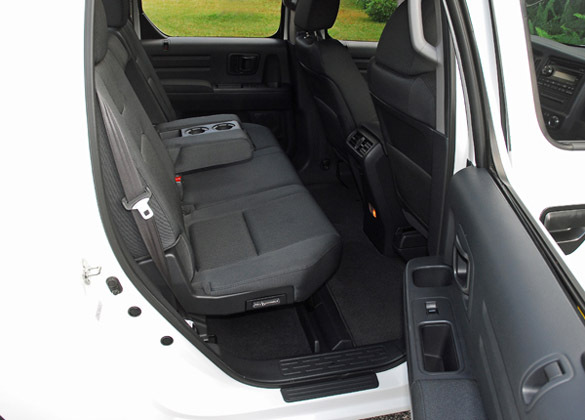 The cargo area measures 49.5 in. wide between the wheel wells, 20.7 in. deep, and 60 in. long (79 in. with the load-supporting tailgate in the down position). The interior takes advantage of Honda’s unit-body packaging efficiency to deliver full-size interior space dimensions while maintaining a garage-friendly, mid-size exterior footprint. 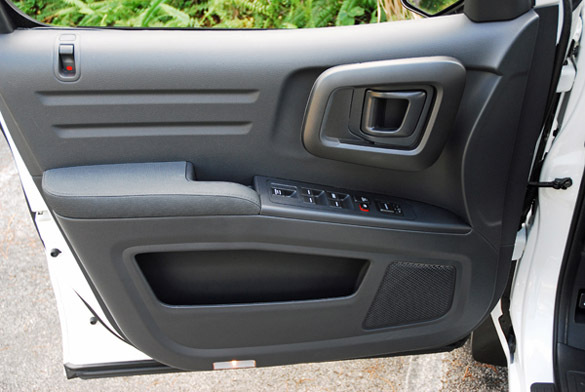 The driving position provides ergonomically comfortable access to large and easy-to-use controls. 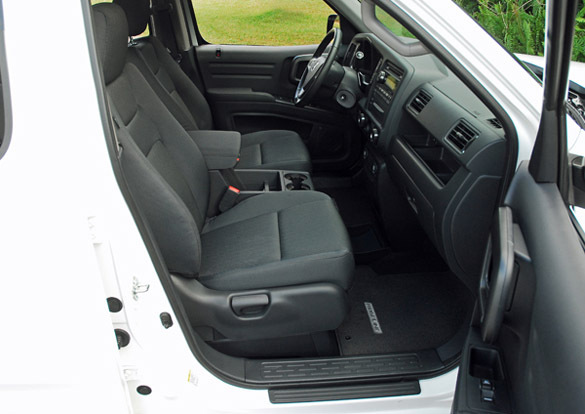 The manual adjustable seats are very comfortable with supportive side bolstering. The drivers-side comes with a height-adjustable hand pump. 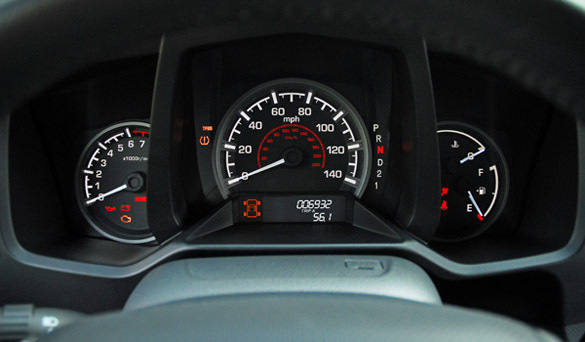 The gauge cluster is easy to see and understand. Ridgeline’s large multi-function console features a sliding armrest, dual cupholders and a sliding lower tray-each with a hidden storage area. Other console storage areas accommodate items both large and small like mobile phones, beverages, compact discs and portable digital music players. 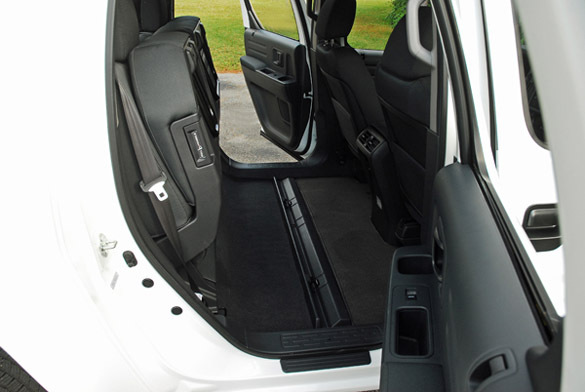 The 60/40 lift-up rear seats feature a storage area underneath large enough to accommodate a golf bag. There is also a pull-down armrest with dual cupholders. Plus the rear seating area can quickly and easily convert for extra cargo duty by lifting the seats up to create enough room for a full-size mountain bike with the front tire removed. The rear seat incorporates three LATCH positions for compatible child safety seats. 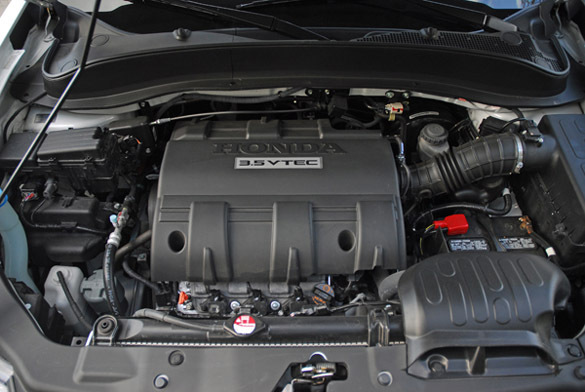 Ridgeline’s all-aluminum, 60-degree, SOHC 3.5 liter VTEC engine produces 250 hp at 5,700 rpm and 247 lb.ft. of torque at 4,300 rpm. Variable valve timing enhances low rpm torque while extending high rpm horsepower for a broad power band. That is plenty of power and torque for cargo carrying and towing capability and to easily merge into fast moving highway traffic. The five-speed electronically controlled automatic transmission features Grade Logic Control to help maintain the most appropriate gear when going uphill or downhill to avoid gear ‘hunting’. The fully automatic Variable Torque Management 4-wheel drive system (VTM-4) provides confident operation in rain, snow, ice, sand and mud, while also improving on-road and towing performance by distributing torque all four wheels as needed. The system operates predominately in front-wheel-drive during dry pavement cruising conditions and continuously proportions toque to the rear wheels during acceleration and low traction situations. VTM-4 lock button on the dashboard allows you to temporarily hold engagement of both rear wheels to aid traction while in gears ‘1’ and ‘2’ at speeds of up to 18 mph. standard equipment for towing includes an integrated tow hitch, transmission and oil coolers, heavy-duty brakes, dual radiator fans and a wiring harness for a seven-pin trailer hook up (pre-wiring only on RT and Sport models). A fully independent MacPherson strut front suspension and a multi-link with trailing arm rear suspension provides a smooth ride and very responsive handling experience more like a sport sedan than a pickup truck. The variable-assist, rack & pinion steering puts the Ridgeline where you want it to go with a great feel for the road with a good on-center feel. Just in front of the engine is a strut tower brace hidden out of view that enhances the front-end rigidity for quick response to your steering inputs. A heavy-duty braking system includes power-assisted 12.6 in. vented discs clamped with dual-piston calipers and 13.1 in. rear solid discs clamped with single-piston calipers for excellent braking from speed. Standard ABS, BA, EBD and vehicle stability assist (VSA) ensure that you maintain control of your direction during severe braking maneuvers and when braking on slick or wet pavement. The Ridgeline Sport come standard with these safety features: advanced dual-state, multiple-threshold driver’s/front passenger SRS airbags, front side airbags with passenger-side Occupant Position Detection system, two-row side-curtain airbags with rollover sensor, front-seat active head restraints, a tire pressure monitoring system, daytime running lights, 5-3-point safety belts with front pretensioners/load limiters, front crumple zone, steel beams in each door and daytime running lights. Standard equipment in my Ridgeline Sport vehicle not mentioned above includes leather-wrapped/tilting steering wheel with cruise control and audio buttons, AM-FM-CD auto system with 6-speakers, MP3/auxiliary input jack, A/C with filtration system, multi-function trip computer, rear console vents, power windows/door locks, illuminated vanity mirrors, power sliding rear cabin window, 12-volt power plug, all-weather floor mats, maintenance minder, fog lamps, rear primacy glass, remote entry, dual map lights, variable speed wipers/washers, grab handles at each rear door, map pockets behind the front seatbacks and thick-cut pile carpeting. 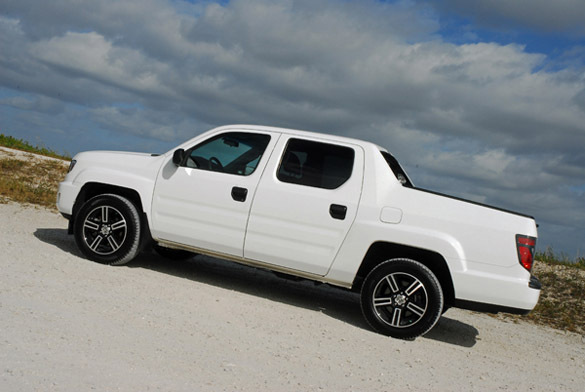 The 2012 Ridgeline Sport is an excellent pickup truck that can take care of most of your personal, active lifestyle and business needs with its unique interior and cargo bed storage areas. It is one of the smartest looking and well put together pickup trucks on the market today and with the new Sport package, one of the best looking. Minimum ground clearance: 8.2 in.